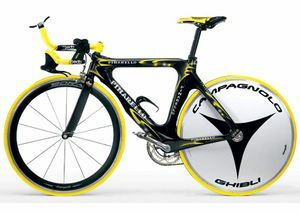 Pinarello is an Italian bicycle manufacturing company (1952 to present) based in Treviso, Italy. The company supplies mosly hand-made, high end bicycles. 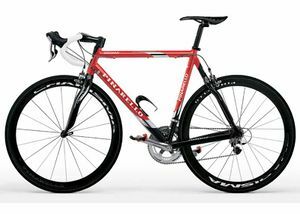 The company makes bicycles for road racing, track racing, bicycle messengers, and cyclo-cross. GIOVANNI Pinarello , the eight of twelve brothers, was born in Catena di Villorba in 1922. He was born at a time when life could be rather difficult, which was not uncommon, for many families of humble, and peasant backgrounds, in the rural farming areas of Veneto. The struggles of a simple farming life, as well as surviving the hardships of both World Wars, greatly effected an influenced the life of Giovanni Pinarello and his family. His impoverished and simple upbringing was not able to extinguish a passion Giovanni discovered he hard for the "Two Wheels". In 1952 an opportunity presented itself to Giovanni Pinarello as a direct result of a major disappointment in his cycling career. The opportunity was for him to become an integral part of the very beginning of manufacturing world of bicycles in Treviso. The disappointment was that he had to give up his first love and passion, bicycle racing. Pinarello was fortunate to be in a very economically prosperous area of Italy. This area was also synonymous with cycling and known for its manufacturing excellence. His intuition told him to take advantage of the opportunity that presented itself, and to be part of the world of team sponsorship. At first he began by helping to promote and advertise for small local teams. He also aided in the survival of the teams with whatever they needed to be able to participate in the competitive and expensive world of racing. The first team to participate in a national competition with a Pinarello bicycle was la Padovani, in 1957. This marked the beginning of sponsoring many bicycle teams. Sponsorship was a very important and crucial vehicle in the recognition and promotion of the Pinarello name. It also helped to promote his bicycle store in Treviso. In 1960 came the sponsoring of the first professional team, the Mainetti, which developed and produced many champion cyclists of the area. In 1966 the success of Guido de Rosso truly made a difference for Pinarello in the professional world of cycling. His victory in the Tour d'Avenir in France put the Treviso on the cycling map. This was the first international victory for Pinarello. Cipollini has infact, together with Indurain, been a famous testimonial of Pinarello's advertising campaigns. More recently, the success of the current teams, particularly Telekom, Brescialat and Banesto, should be mentioned.